The next 4 players eliminated from Day1B all cash for $650 today but do not advance to Sunday's Day 2. Mimi Luu is eliminated A7>QJ on a 8-x-7-A-5 board. 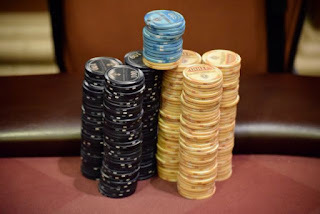 Play ends when down to 19, those players bagging their chips and coming back at 11am Sunday for Day 2, joining the 13 already moving on From Day 1A ... and those yet to advance from the last two starting flights. Meanwhile, back at Day 1C, 107 remain as play moves to Level 9, blinds of 300/600 with 75 antes.